Click the image to the left for the detailed reporting on the solar power energy production. They say ‘a picture is worth a thousand words’ so I’m hoping you enjoy this one and the graphic below which I’m glad to explain in more detail, if you want to email me at the above address. Basically, the story behind these solar panels is one of collaboration and a desire to make a lasting difference in our community, for all the residents but mostly for our kids --- and to act as a ‘shining example’ to other Calgary communities who are looking at alternatives to reduce their collective carbon footprint. 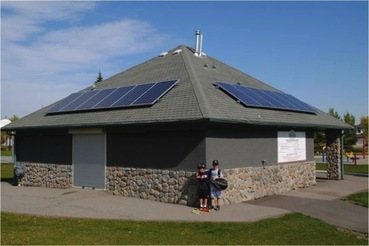 What you see above is the First Community-funded Solar Power project in Calgary! When the sun is shining, the solar panels are producing DC power which gets converted to AC power. Guess why we need AC power in the summer? Correct – for the water park! The Somerset Residents Association (SRA) pays Enmax for the power to run the water pumps that provide so much joy for the kids each hot summer day. What better way to help ‘green our community’ than to generate some of that power ourselves? So the SRA and Somerset-Bridlewood Community Association (SBCA) joined forces financially in 2011 to submit our request to Enmax to cover as much of our 2 south-facing roofs as possible. Enmax contracted the installation to local experts Skyfire Energy and after 2 days the system was up and running, just before the May long weekend! A cellular modem from TELUS was added in 2012 for wireless Internet access to the power management system. As you can see, it was very much a multi-team effort here. The Somerset Community solar power system has a maximum generating capacity of 2,556 Watts of power. Per the graphics below, we have generated an incredible 8,590,000 Watt-hours of power since 2011, which equates to the net effect of 152 trees offsetting almost 6 tons of CO2 Green House Gases (GHG) from polluting our atmosphere! And when we don’t need this green power at other times of the year it is sent back out to the Alberta electricity grid for others to use, and Enmax pays the SRA for doing so. We encourage you and your kids to take a look for yourselves! I will continue this article next month with a discussion around the broader energy production issues in Alberta, and what other jurisdictions in Canada and elsewhere are doing to tackle climate change and create new opportunities for our youth.